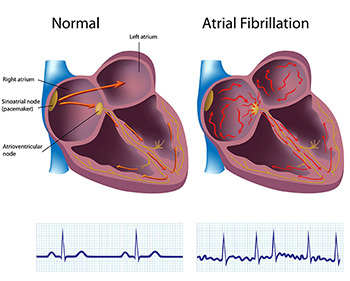 Atrial Fibrillation or A fib, is an irregular and rapid heartbeat, arising from the heart’s upper chamber (atrium), and conducted downwards to the heart’s main chambers (ventricles). Other symptoms of a fib typically include palpitations, shortness of breath, chest discomfort and dizziness. Many people however have no symptoms. During a fib, the regular pumping action of the atria is replaced by irregular and quivering spasms of atrial tissue. This results in the failure of the atria to fill the ventricles completely and, consequently, the failure of the heart to pump adequate amounts of blood to the body may occur. Often, the greatest concern is that the reduced cardiac output can lead to blood pooling in the atria and the formation of blood clots. Blood clots in the left atrium can dislodge and travel through the bloodstream to the brain, resulting in stroke. Rate Control - Many times atrial fibrillation is associated with a rapid heart rate. Medications can be added such as beta blockers, digoxin or Cardizem to control the rate. Cardioversion - In some situations especially when patients don’t feel well they can undergo a cardioversion, done in the hospital with sedation, where an electric shock is painlessly administered to the chest. This converts the patient’s heart rhythm back to normal (sinus) rhythm. Not all patients require cardioversion. Anticoagulation (use of “blood thinners”) - A fib is associated with the formation of blood clots in the heart. Medicines are therefore usually started that interfere with blood clotting, thus helping to reduce stroke risk in people with atrial fibrillation. Traditionally we have used the drug Coumadin (also known as warfarin) in this role. Because Coumadin requires monitoring and frequent dose changes a a newer drug, Pradaxa has been introduced that is equally effective requiring no blood test monitoring. Both drugs are equally effective at preventing strokes. In a small percentage of patients aspirin can be used instead of Pradaxa or Coumadin.